What type of headache are you suffering from? Posted by Impulse Chiropractic February 18, 2019 Comments Off on What type of headache are you suffering from? Headache is one of the most common neurologic symptoms experienced by adults and children. Most people have experienced some type of headache pain in their life. It is most often derived from benign causes and they are often harmless. There are many different types of headaches and each type of headache affects everyone differently, making them a very complex condition! There has been much research conducted to determine the mechanisms responsible for causing the pain related to headache. The brain has no pain receptors and therefore the brain cannot feel pain. The membranes and blood vessels surrounding the brain are densely supplied by nerve fibres capable of transmitting the experience of pain. Most of the other structures surrounding the head and neck such as eyes, ears, nasal sinuses, muscles, joints, and arteries are highly pain sensitive. This means that disorders related to these structures have the capacity to transmit pain and express itself as a headache. Irritation of these structures through mechanical, chemical or inflammatory mechanisms can cause pain. These pain signals are sent back to the brain from their source, however the brain cannot always determine where the pain signal is coming from which is why it is sometimes difficult to isolate the source of a headache. Headaches are one of the more common symptoms presenting to our chiropractic clinic. Chiropractic treatment can be effective in the management of certain types of benign headaches. Theses types of headaches include tension-type headaches, migraine headaches and cervicogenic headaches. 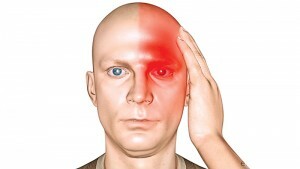 Tension type headaches are the most common type of primary headache. Most individuals will experience a tension headache from time to time throughout their life. The exact causes of tension-type headaches are still uncertain. It was once thought that they were related to muscle contractions of pain sensitive structures of the head, however this theory has largely been disregarded. 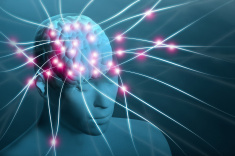 It is thought that they are likely to occur due to an interaction of different factors that involve pain sensitivity and perception, as well as the role of brain chemicals. Genetic, physical (posture), psychogenic and emotional factors (stress) also play a role in this type of headache. Migraines are thought to be a type of neurovascular headache. It is a complex, recurrent headache disorder that is one of the most common complaints in medicine. Although a benign type of headache it has the capacity to cause severe and debilitating pain that can last for days. Some individuals will experience unique symptoms preceding the migraine headache, often referred to as aura. These symptoms can develop over 5-20 minutes and last up to 60 minutes. These symptoms are usually visual changes/disturbances. They can also be sensory and/or motor changes also. The exact cause of migraine headaches is still unknown however it is thought to be related to a complex series of neural and vascular events. Migraines have a strong genetic linkage. Approximately 70% of migraine patients will have a first degree relative with a history of migraine. Migraines are also found to be much more common in females, with approximately 75% of suffers being women. Cervicogenic headache is a term used to describe a headache originating from the upper cervical joints (C1-C4). 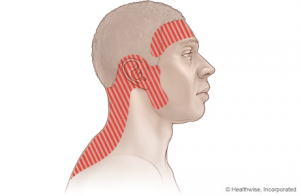 Multiple structures in this area can be responsible for referring pain into the head. These structures may be the joints, muscle, ligaments and intervertebral discs at these levels. Cervicogenic headaches typically present as one-sided pain at the base of the skull and/or a referred pain to the front/side of head and face. Pain is often exacerbated by neck movement, sustained awkward head position or external pressure over these areas. When you combine a treatment program that focuses on re- addressing the physical stressors (Chiropractic is an option) and looking into minimising the other mental/chemical influences on a headache cycle, positive results are potentially maximised. To ensure that you receive the right treatment for your headache an accurate diagnosis is essential. As mentioned, there are many different types of headaches some of which can be related to severe conditions. It is highly important to differentiate the more common and benign forms of headache from those that indicate a serious pathology. Please seek a professional for the diagnosis and management of your headache.